Partners in Development (Pty) Ltd (PID) is a hands-on, multidisciplinary engineering consultancy based in Pietermaritzburg, KwaZulu-Natal. Partners in Development (Pty) Ltd (PID) is a hands-on, multidisciplinary engineering consultancy based in Pietermaritzburg, KwaZulu-Natal. PID offers research, design, project management, and construction services throughout KwaZulu-Natal and the rest of South Africa. With a focus primarily on developing communities, PID works mainly with water supply and sanitation, but also has experience with township services and more general environmental engineering. PID has provided planning, design, training and construction management services on over 200 infrastructure projects to date. The majority of these have been in rural water supply and sanitation, but they have also included roads, sports facilities, township services, agricultural infrastructure, school sanitation, and the management of several major community-based domestic sanitation projects. In all projects the use of labour has been maximised and managed according to the principles of labour-based construction. Through consulting and research, PID is able to share knowledge and lessons-learned both nationally and internationally, advancing community development on a global scale, especially in Water, Sanitation and Hygiene (WASH). We are partnering with the DBE and Domestos to help 150 schools in South Africa improve their ability to manage their school toilets! 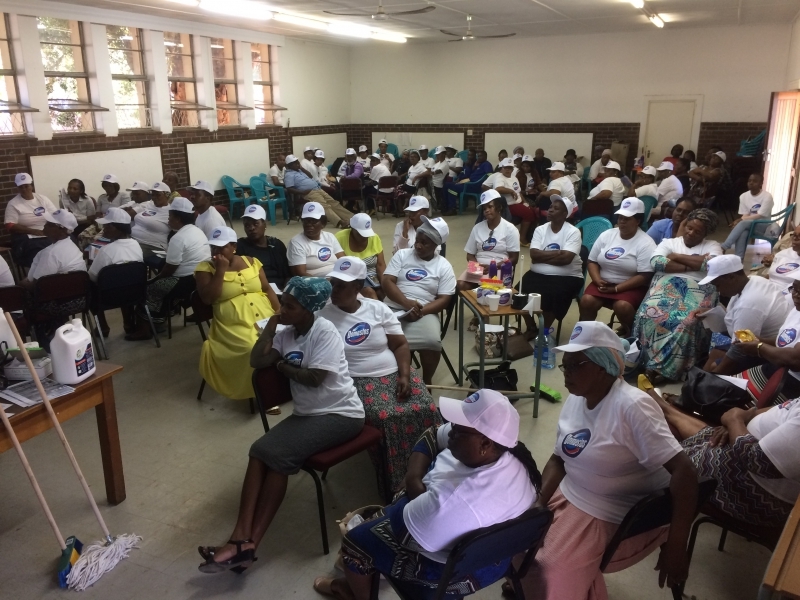 In the month of May 2018, our team conducted training sessions with school cleaners from 150 schools, including 50 in Pixley Ka Seme District (Northern Cape), 50 in Ugu District (KZN), and 50 in Umlazi District (KZN). The training sessions included practical training about why the toilets need to be cleaned daily and how to clean them in a way that fights diseases, by using Domestos, a bleach product. We also covered administrative aspects of management and shared these things with school principals as well, so that all-around management can be achieved. We'll be following up in the next few months!